So, I bought a Rainbow Cup on impulse from AliExpress (http://www.aliexpress.com/store/group/Lady-Care/826080_251231311.html), and it came today. I was pleasantly surprised. It doesn't seem to be a knock-off of any other cup and seems to be of better quality than the Jasmine Cup I bought a while ago. I think this could turn out to be a good, inexpensive (price has gone up from $10 to $16 with free shipping) cup for people looking for a soft, V-shaped cup with decent capacity and grips. The Rainbow Cup comes in a glossy white box with a striped cotton pouch and instruction sheet. I got the smaller size in cyan. Measurements look very similar to the small LadyCup; stem is just a little longer. Grips: 3 rings around base and 4 rings around stem. Not quite as raised as FleurCup, but quite grippy. Holes: 2. Medium sized. No side seams. Finish: peachskin. "Rainbow" in small raised letters on the inside rim. Stem: solid, fairly firm. This might bother me. We'll see. Softness: quite soft, a little firmer than the Cuplee, but softer than the small FleurCup. I doubt I'll have trouble getting it to pop open. I haven't tried burn tests on any of my cups, so it might be hard to say! It's definitely springier than TPE; even though it's pretty soft, it is springy like my other silicone cups. In a number of ways, I think the design is an improvement over the LadyCup, which I am often hesitant to recommend because of the capacity and slipperiness. Weird...I just checked on my link, and all items have been removed from the shop. I think the Rainbow Cup is still available on Amazon, though. http://www.amazon.com/style-Rainbow%C2%AE-Reusable-Menstrual-Yellow/dp/B00CV7E8XU . It looks very similar to the one I bought on Ebay for $10. Is your stem flat or round? It's difficult to tell from the pictures. Everything else seems similar to mine, just maybe better made, as mine definitely has side seams. Similarities: size, smell (I guess yours smells as disgusting as mine), softer grips than on Fleurcup, peachskin finish. Can you post how you got rid of the smell if you manage to do it? I am at the end of my witts - sunning it out is the only thing I have not done yet. The stem is cylindrical and solid, about the same diameter as the LadyCup's hollow stem. Wasn't the cup you got a Lunette knock-off? If it wasn't, I'd be interested in seeing photos! I am super busy for the next week with finals but will attempt to get the plastic smell out after that. Hey, does your Rainbow Cup have a plastic smell? Please tell us if you try the burn test. I will have to cut mine when it gets here I have to take the whole stem off all of my cups I will try the burn test if noteasy2begreen wishes to leave theirs intact. I'd guess your cup must have the exact same look/aspect as the small Lunette, that is the first cup ;) we see on the photo by noteasy2begreen, but in a pink shade. Except the 4 holes of the Lunette + the grips on the base may be less raised on your cup ;). It's a little softer than a small FleurCup. The softest cups I own are the Meluna mini (small, soft) and the Cuplee, and the Rainbow is a little firmer than those two, but definitely softer than a small FleurCup. It looks nice I really wish it wouldn't have taken them over a week to ship mine. And the box and especially the pouch are very lovely, too! 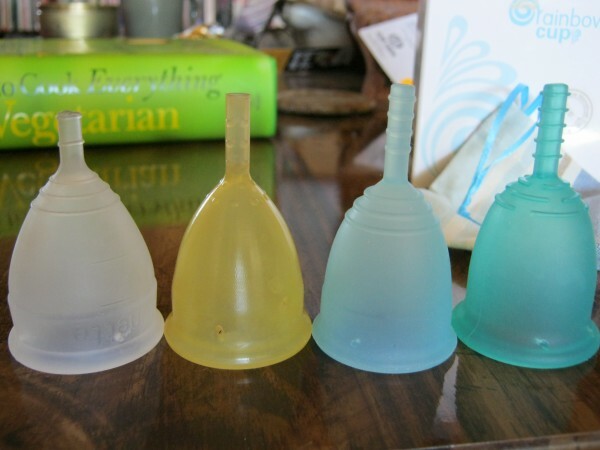 If you tested your Rainbow cup, I hope you got every step easily going.. insertion, removal and all..
Maybe you had to cut the stem off entirely? By the way, by mere chance, I wondered if this cyan cup might be a soft version of the Rainbow, like the Meluna's ha.